After the Romans abandoned Britain, telling them to “look to their own defenses,” they scrambled to do just that, because they were immediately invaded by the Picts from the north. This is a Pict. 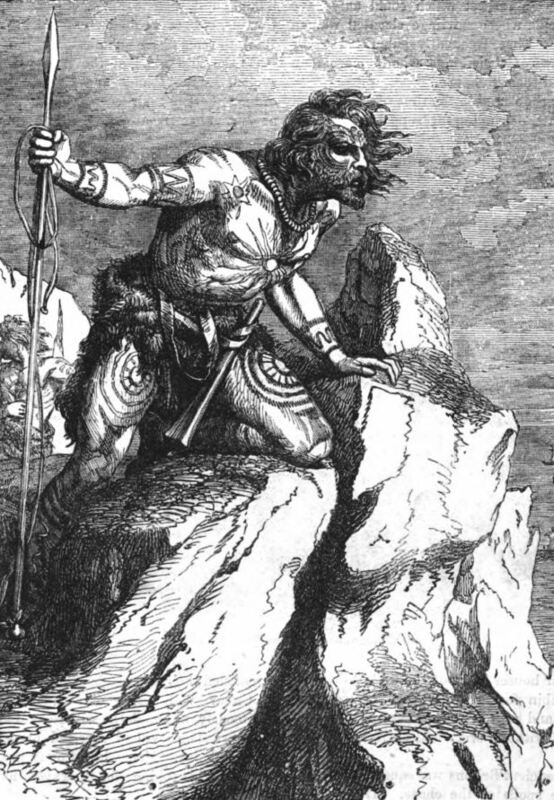 The Picts lived in what is now Scotland. They painted their bodies before going into war. They fought fiercely and frequently. Public domain. King Vortigern sent out a cry for help to the Saxon kings of northern Germany and they came sure enough, only they didn’t leave again, which was not at all what Vortigern had had in mind. Vortigern is legend just like King Arthur. It is likely he was a real king, but we don’t know for certain. 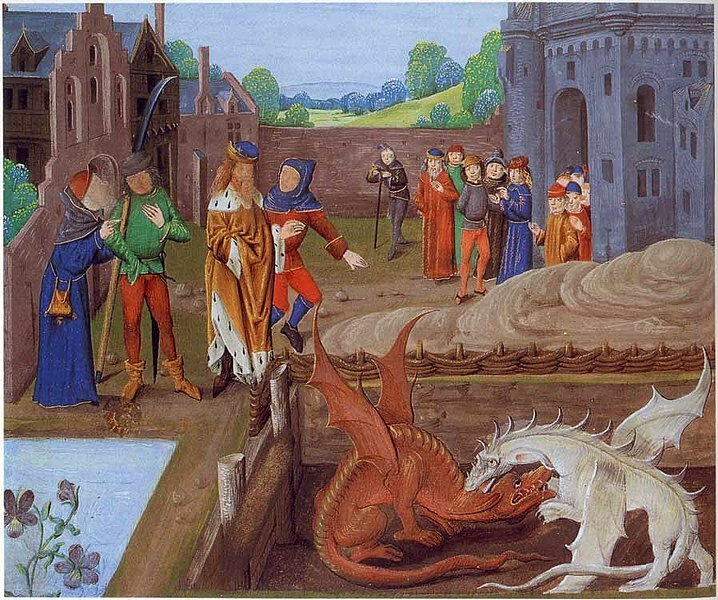 This picture shows Vertigorn watching a battle between two dragons while a young Merlin interprets the meaning of the event. Public domain. The Britons, descendants of the Celts with a smattering of Roman blood thrown in, were divided into many small kingdoms and dukedoms which squabbled among themselves as well. This is the time period from which the rumors of a great High King named Arthur appear. 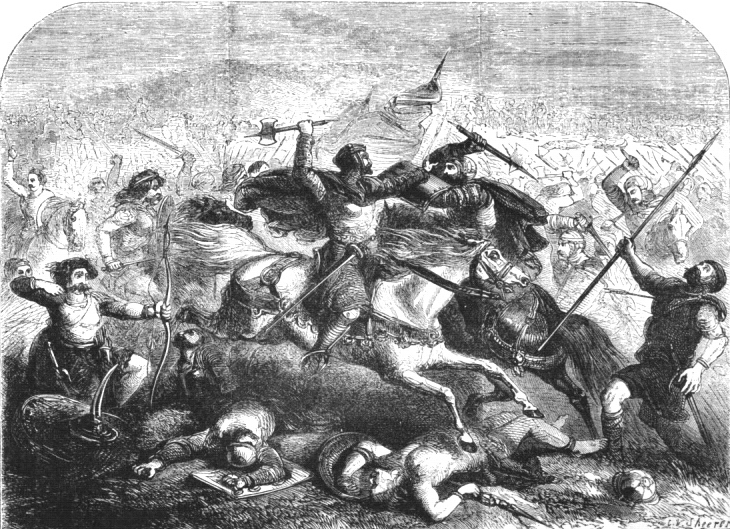 This is Arthur defeating the Saxons, who after their invitation by Vortigern decided not to go home, but to take England for themselves. It was this need that produced King Arthur and the legends surrounding him. Public domain. For awhile the Britons held off the Saxons, but eventually they pushed the Britons to the far western edge of Britain, into Wales. The Saxons and Angles and Jutes from the north of Europe established their own kingdoms. Here is a map of Anglo Saxon Kingdoms in the year 700AD. The borders of these kingdoms changed rapidly as the kings fought one another, the Picts and the Welsh, and struggled to keep the Viking invaders at bay. You can color one of your own. Print out this basic map of the Medieval British Isles. Label King Offa’s Dike on the border between North Wales and Mercia. They built the dike to defend against the fierce Welsh who had not forgotten, even after hundreds of years, that the land to the west had been theirs once. was written by an Anglo-Saxon Bard. Some great simplified children’s versions exist, give one a try. This period of history in Europe is known as the Dark Ages, partly because we don’t know much about them, since few written records have been found, and partly because after the fall of Rome, Europe descended into chaos, which took nearly a thousand years to recover from. Anglo-Saxon elected their kings. It was not a hereditary position. English common law, and therefore American law, descended to us from this time when individual rights were respected, kings were constrained by law, and property and life were sacred. The Roman Celts and Anglo-Saxons based their ideas of law on the Old Testament. Britain was Christian at this time. They would lose their religion with the Saxon invasions, but be reconverted centuries later. This map activity is from Unit 2-5 of the Layers of Learning Homeschool Curriculum. Try it out. Unit 2-5 contains this map activity and much more. An easy paper castle to print and make.